Independence Station the way it looked this May 7. In Independence, they’re still looking at this concrete skeleton in the middle of town. More than a year since I last reported on what was intended as a showcase of sustainability, nothing seems to have happened to the unfinished structure except that it now has a sign saying it’s for sale. A Salem developer started the project in about 2005. It would be about the greenest building around, a model of environmental efficiency, with heating and cooling powered by solar energy and biofuels. The plans called for shops and offices as well as 15 apartments projected to sell for $250,000 each. 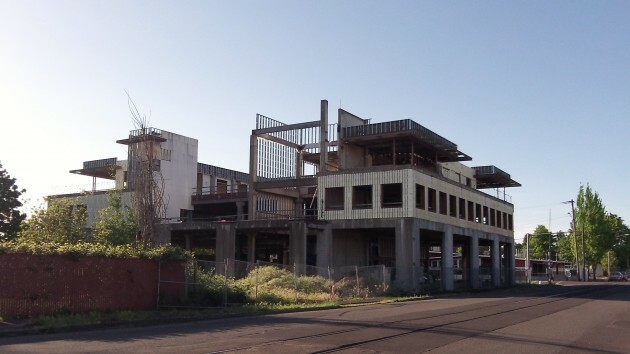 When I passed the site the weekend before last, the building looked just as unfinished as it did in February 2015, when the city manager, David Clyne had told me the city hoped the structure would be either finished or torn down. Since no progress had been made toward either outcome, I asked if nothing could be done to get things moving. “Unfortunately it is not city property,” Clyne replied. “Short of condemning it (big bucks), the city is pretty much as helpless as everyone else.” About a year ago the developer took out a loan to pay off a city lien for about $600,000 in systems development charges. Clyne understands the developer has less than a year to pay that off. Thank you for posting this. I visit Independence often and was wondering what that horrible building is. Perhaps they could reinvent it as the great Independence monument to stupidity. They could put a sign on the freeway near Salem and charge a nickel for tours. This is probably their best shot at getting any return on the investment. If we’re very lucky, it may be possible for interest rates to rise enough to slow the next bubble which is clearly visible in Portland, Bend, and (Ugh!) Corvallis. Yes, agreed Howling! Timing is everything in life. HH, posting idea for your consideration….why is Benton County widening RobinHood? Your investigative efforts appreciated. Cheers! I too was wondering about Robinhood. i have seen some other streets in much worse shape. Will get an answer Monday. I hope.